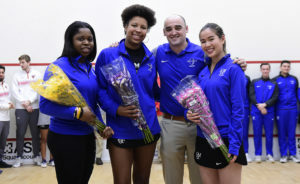 On Senior Day this past Friday, the F&M Women’s Squash Team beat No. 23 St. Lawrence by a dominating score of 8-1. The team’s three seniors, Andreina Benedith, Lauren Johnston, and Sherilyn Yang, were all honored before the start of the match. The Dips earned sweeps at each of the top four positions, with Yang (No. 1) Johnston (No. 2) and Benedith (No. 3) each coming out stronger than ever on senior day with impressive 3-0 wins. F&M’s Ellen Verry at No. 4 also had a 3-0 win. Four additional Diplomat wins came from Clare Tompkins (No. 7) and Katie Anderson, both of whom battled back from 1-0 deficits to win three consecutive frames, each totaling final scores of 3-1. F&M has now won 10 straight against St. Lawrence, dating back to the 2007-08 season. With a quick one-day turnaround, the Dips faced off against Dickinson this past Saturday. Coming up just short in a tough 5-4 loss to the Red Devils, the contest marked the final regular-season match of the 2017-18 season. Coming out strong, F&M had success at the top portion of their ladder with 3-0 sweeps from Yang and Verry and No. 1 and No. 4., respectively. The difference in the match came towards the bottom of the order, with Dickinson winning the No. 7, 8, and 9 contests. Overall, five individual matches went past three games with four being pushed to five. F&M Women’s Squash returns to action this upcoming Friday, Feb. 16th at the CSA Team Championships, hosted by Harvard. Sophomore Gabby Goodwin is the Sports Editor. Her email is ggoodwin@fandm.edu.